APOGEE is a high-resolution near-infrared spectrographic survey of ~100,000 stars in the Milky Way galaxy. The Instrument Development Group played a key role in the optomechanical design of the spectrograph. The spectrograph will work in H band, from 1.52 to 1.69 microns, with a resolution of order 20,000. 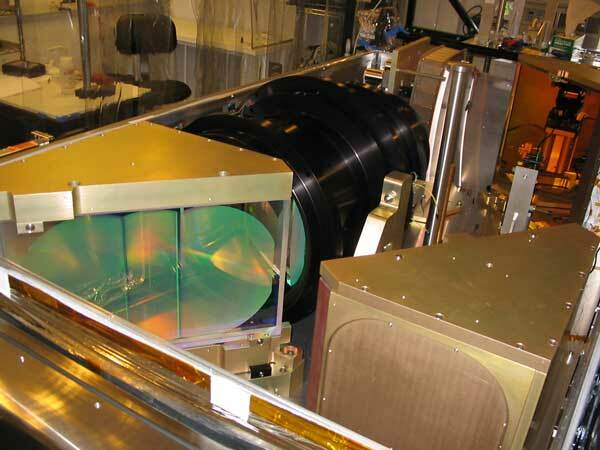 The APOGEE spectrograph uses 300 low-OH (“dry”) fused silica fibers with a FOV of 2″ to transfer light from the plug plate on the SDSS-III telescope focal plane to the spectrograh located in an adjacent instrument room. To minimze thermal background and improve instrument stability, the optical system operates at liquid nitrogen temperature and is isolated from the ambient by the external vacuum vessel. The IDG was responsible for the the design and testing of the articlated collimating mirror, the fold mirrror mounts and the mount for the volume phase holographic (VPH) grating, all of which function at cryogenic temperature.